As a new year approaches, I realize that we move further and further from our youth. As someone born in the late 1980s, the cars I grew up with are starting to really show their age. As we move further and further away from the 1990s and 2000s, we are able to look at the designs and analyze how well they have held up. Behold the clean and simple looks of a 6th generation civic pictured above. Clean lines, and a mixture of smooth edges and hard lines, that still pleases the eye. Mind you, there were very complicated looking vehicles at the time, especially from Pontiac, but much of the industry used simple designs. So now we look at the modern civic. This is a design which has certainly a “love it or hate it” factor. I for one like it, but there is no denying that the car is very busy looking. This vehicle also struggles to hide its visual size and weight. At a quick glance, anyone would be forgiven if they confused the current civic with an accord, the vehicle appears so large. Why do I mention all this? To show that there is a lot to love about the design of cars from the 90s and 00s. BUT. There is something which is looking worse and worse by the moment; Altezza(Lexus IS) tail lights. At the time I first laid eyes on the Lexus IS, I was awestruck. It was a fantastic looking vehicle, and the centerpiece was the tail end. Circle lights mounted on the trunk and then a full assembly of lights nearby, enclosed in clear plastic. It was a massive departure from what we were used to. For a long period of time the tail light was an afterthought, just a big block which was there to function and nothing else. Now mind you, before the Lexus IS manufacturers could style the shape of the assembly to make it flow with the car, but now, the actual assembly could be styled. It is worth mentioning that the Supra did pretty much the same thing earlier, but the Lexus IS is the one that made it stick. So what soured me on the amazing altezza light? The aftermarket. Within a year, every catalog was full of altezza lights. With their gleaming chrome housings and circle lamps, you could make your 1988 civic look like a new Lexus. A first generation Mazda 3. It does a good job of using the look, but not being too busy. My Honda S2000. This one is a nice design, but it does not have a timeless look and blends in with other cars from the time. I’m glad that Honda kept the design simple, but nothing about it makes the car seem special. 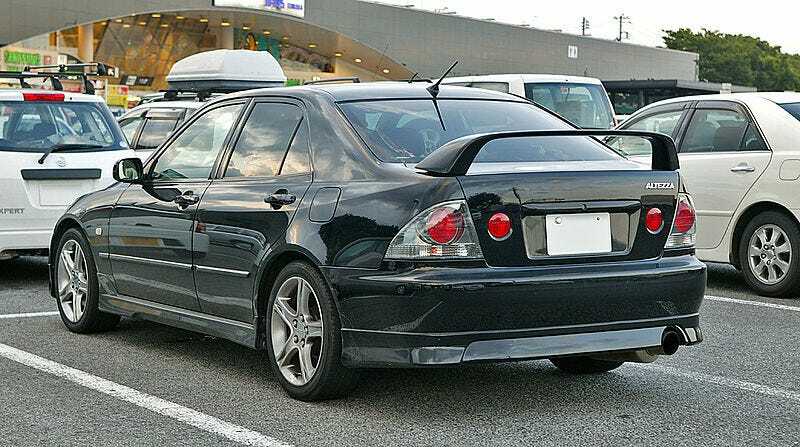 This is a 2003 Lancer Evolution. This is one of the worst examples of the copy cats. Ever time I see one I always wonder why someone would put cheap aftermarket lights on their car. Sadly they were like that from the factory. As you can see, the altezza light was shamelessly copied over the next decade.Some pulled it off better than others, but none of them were fantastic, and all look dated today. I personally feel that designers are doing fantastic work with tail lights. Compared to older vehicles, many assemblies have become more compact, but they are no longer an afterthought like they were pre-altezza. Now the tail lights feel cohesive and styled, but are not garish or gaudy. In conclusion, we need to take altezza lights for what they were, a rough draft, the initial work that got us to a finished product. Think about it like the PSX vs the PS2. The graphics on the PSX were chunky and do not hold up well compared to what followed. There is no shame in that though, we had to start somewhere when it came to 3D polygons, and we had to start somewhere, when it came to modern car styling. What do you all think about the altezza light?